As I prepared to enter the Thomas Struth retrospective at the Whitechapel, there was a problem. Blocking the way to the exhibits was me. Or, at least, someone who looked exactly like me. Big belly. Loud shirt. Shorts. Sandals. Glasses. An expression of blobby insouciance on his face as he stared up at an unseen artwork displayed above his head. The fat guy was so like me, I felt violated. Cloned. In fact, the doppelgänger was a life-sized tourist whom Thomas Struth has photographed at the Accademia Gallery in Florence, looking up at Michelangelo’s David. We probably weren’t even related. All the art-lovers arranged in a row in the giant photographic diptych that greets you at Struth’s intriguing Whitechapel show were unknown visitors to Florence whom the artist observed at the Accademia, staring up at David. By photographing the crowd rather than the exhibits — by examining the visitors from the viewpoint of the exhibits — Struth is revealing curious aspects of our gallery behaviour. My guy was one of the few in the show’s opening image who had his mouth shut. (Hmm. Perhaps it wasn’t me after all.) Most of the others had their mouths open, in what appeared to be sag-jawed artistic adoration. An Asian couple, who looked as if they were on their honeymoon, were transfixed. Two older chaps in sensible shorts and checks were transported. The little Mexican kid in the England T-shirt was transfigured. All of them gaze up at the unseen David looming over them with divine ecstasy fixed into their faces. This is actually a brilliant piece of observation by Struth. It seems to record the power of art, but what it really records is a crude biological imperative: when you tilt your head back, your mouth drops open. The fact that Michel-angelo’s David is so tall, and is displayed on such a lofty plinth, forces you to tilt your head back to look at him and then to open your mouth. Go on, try it. Look up at the ceiling and see what happens. It’s simple physiology. But, interestingly, this combination of eyes rolled upwards and mouth dropped open is exactly the look you also see on the faces of the overwhelmed saints in baroque paintings. St Teresa in ecstasy. St John at the cross. St Paul being called. Whenever you see saints in a religious painting staring at some divine illumination above their head, they appear exactly as the tourists do in Struth’s photograph when they look up at Michelangelo’s David. In the modern world, art and tourism have taken the place of religion and pilgrimage. The conceptual dimension of Struth’s photography — the largeness of his ambition — is what marks him out. Most of the pictures in this show are huge: some of the biggest photographs ever taken. There is a view here of a giant oil rig being constructed in Korea that is 349cm wide and 275cm high. That is near as damn 12ft wide and near as damn 10ft high. That is the scale of the largest 19th-century history paintings. Time, too, is enlarged and trapped. By instinct, photography is an art form that records the moment. But all round this display, Struth’s big pictures seem always to be aiming at the biggest picture. His view of the Pantheon in Rome shows a cluster of seemingly tiny visitors gazing up in worshipful adoration at the huge, glorious, empty space soaring above them. Tiny people. Gigantic location. These are the proportional tricks that Turner also used to prompt a sense of the sublime in his viewers. The point I am trying to make is that Struth’s photography delivers the same narrative pleasures to the viewer that ambitious narrative paintings used to deliver. When a photograph grows as big as this, it looms over you and encircles you. Banal details become fascinating. A sense of a story unfolding around you begins to emerge. The picture’s impact becomes visceral. 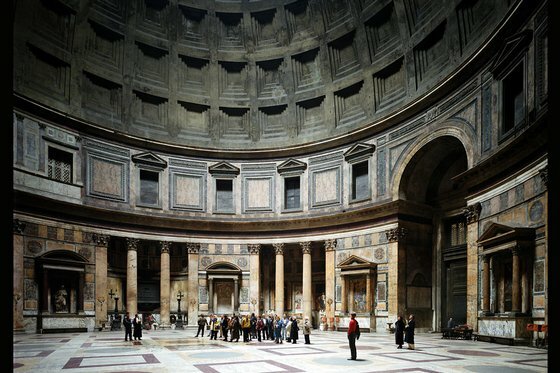 These days, a decent Thomas Struth will set you back £250,000. That is an awful lot of money to pay for a photograph. But not, perhaps, if that photograph does not feel like a photograph. Another giant Italian interior displayed here shows the inside of the church of San Zaccaria in Venice. On the wall of the church, above the altar, Bellini has famously painted a marvellously illusionistic group of saints gathered around the Virgin Mary, in what appears to be a niche set in the church wall. In Struth’s picturing of the scene, the real-life tourists who have arrived at San Zaccaria to admire the great Bellini find themselves involved in its story line instead. Just as the saints around Mary seem to be real, so the tourists in the church seem to be painted. It is no longer clear where the picture ends and the tourists begin. Struth belongs to a remarkable group of modern artists who emerged from Düsseldorf in the 1980s and who are known, accurately but crudely, as “the German photographers”. All studied in Düsseldorf under the outrageously influential photographic double act of Bernd and Hilla Becher. The Bechers taught Andreas Gursky, Thomas Ruff and Candida Höfer, as well as Struth. That is a mighty group. It includes some of the best-known (and most expensive) artists at work in the world today. Apart from the fact that they all studied under the Bechers, what unites them is their intriguing timeline. Basically, all of them began their careers as photographers; yet all are now clearly thought of as artists. This transformation from photographer to artist is one of the defining transformations of the art of our times. I remember going to lots of Bernd and Hilla Becher shows in the past and being confronted, invariably, by row after row of strict black-and-white photography, all about A4 size, all showing battered water towers sought out by the Bechers in the industrial heartlands of Germany. Every photograph was framed identically. Every label noted the place and time. It was like a school project, or a piece of scientific tabulation. Here is one water tower. Here is another water tower. These are water towers. As it happens, this austere German approach yielded quiet pleasures of its own. The minimalism and regularity of the Bechers’ photography gave their work an insistent thoughtfulness. What you did not get, however —and what Struth now supplies in abundance — is visceral impact. Pictorial involvement. Full-colour joy. Encirclement. These are changes driven by technology, of course. Colour photography on this scale was impossible before now. But with the switch in techniques has come a switch in approach. Although it is a retrospective, going back to 1978, this show has mixed up the different phases of Struth’s career and chosen to present his output in loose arrangements of themes. Audience behaviour in an art gallery is one of them. Man-made wonders behaving like natural ones — giant Korean oil rigs looming above you like mountains — is another. A particularly interesting group features single families arranged in clusters like a group portrait by Frans Hals. Then there are the jungle photos, large close-ups of exotic vegetation that feel somehow abstract, as if all the leaves and tangled-up plants before you were trying to mimic the dynamics of a Jackson Pollock painting. In all these cases, photography looks as if it is borrowing the methods of painting. Which is why it is now able to charge painting-sized prices.